Past reports and supplemental materials for the Sector Monitor. Slightly fewer charities reported that they experienced difficulties and the percentage of organizations that predicted they’d be better able to deliver on their mission in one year increased. However, sector stakeholders should be on the lookout for emergent challenges and adaptive strategies related to increased demand. Responses to this edition of the Sector Monitor indicate a return of confidence among charity leaders amid the trend of continued financial pressures. Levels of human and financial resources appear to have remained constant. Recent findings also point to confidence in the future varies with organizational stress and predicted capacity to deliver on mission. Responses to this edition of the Sector Monitor indicate a decrease in confidence among charity leaders over the past year. More leaders are predicting their charity will be weaker, in terms of its ability to carry out its mission in the near- and medium-term and that the financial and human resources of their organization will decrease over the near-term. In terms of recent experiences, more leaders are reporting their organizations currently face increased demand but stagnant revenues, compared to a year ago and they are less likely to report increased expenditures. 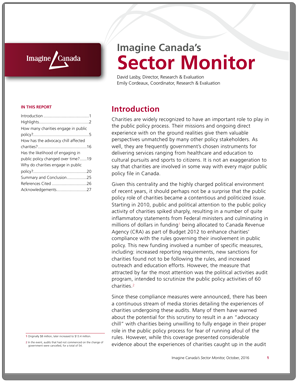 Welcome to Imagine Canada’s fifth Sector Monitor report since the program began late 2009. In this report we present results from our newly expanded survey sample which almost doubles the number of charities surveyed previously. Survey findings from mid-2011 suggested increased optimism; this does not appear to have continued. This Sector Monitor edition presents mid-2011 results. A total of 1,447 leaders of registered charities responded to our fourth Sector Monitor survey, which was open between May 25 and June 30, 2011. Throughout this report, we compare the results of the most recent survey with those of the three previous surveys. 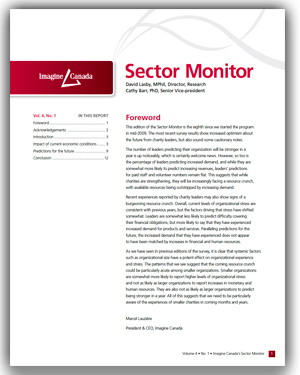 This issue of the Sector Monitor looks at conditions in late 2010. The report presents results for the Monitor’s core set of tracking questions and summarizes the responses of 1,625 leaders of registered charities who participated in this edition of the survey. This issue of the Sector Monitor report compares conditions from the first half of 2010 to the baseline established by the first survey. The primary focus is on exploring the effects of the economic downturn that have continued to unfold since 2009. The report summarizes the responses of 1,523 leaders of registered charities who participated in our survey. The first version of the Sector Monitor focused on the effects of the recent economic downturn on registered charities. The report summarizes the responses of 1,508 leaders of registered charities who answered our online survey. In addition to providing current information on the state of the sector, these results provide a valuable baseline for assessing the ongoing impact of the economy on Canadian charities and the communities they serve.